Joey DeFrancesco is a four time Grammy® Award-nominee, with more than 30 recordings as a leader under his belt. He has received countless Jazz Journalist Association awards and other accolades worldwide. Accompanying Joey DeFrancesco at SCMC will be his group, known as “The People”. Concert tickets for Joey DeFrancesco and “The People” are $35 and $40 and can be purchased by calling St. Cecilia Music Center at 616-459-2224 or visiting the box office at 24 Ransom Ave. NE. Tickets can also be purchased online at www.scmc-online.org. A pre-concert reception for $15 begins at 6:30 pm, including wine and hors d'oeuvres,is available by reservation in advance (by Friday, February 1). A post-concert party with dessert, coffee and wine is open to all ticket-holdersto meet the artists, obtain autographs and CD purchases. St. Cecilia Music Center (SCMC) will bring Multi-talented Jazz Musician Joey DeFrancesco and his quartet “The People” to Grand Rapids on February 7, 2019. DeFrancesco is a four time Grammy® Award-nominee, with more than 30 recordings as a leader under his belt. He has received countless Jazz Journalist Association awards and other accolades worldwide, including being inducted into the inaugural Hammond B3 Organ Hall of Fame in 2014, the Philadelphia Music Walk of Fame in 2016, as well as, topping the Critics Polls in DownBeat Magazine eleven times over the past fifteen years, and the Readers Polls every year since 2005. Accompanying Joey DeFrancesco at SCMC will be his group, known as “The People” - drummer Michael Ode, guitarist Dan Wilson and saxophonist Troy Roberts. 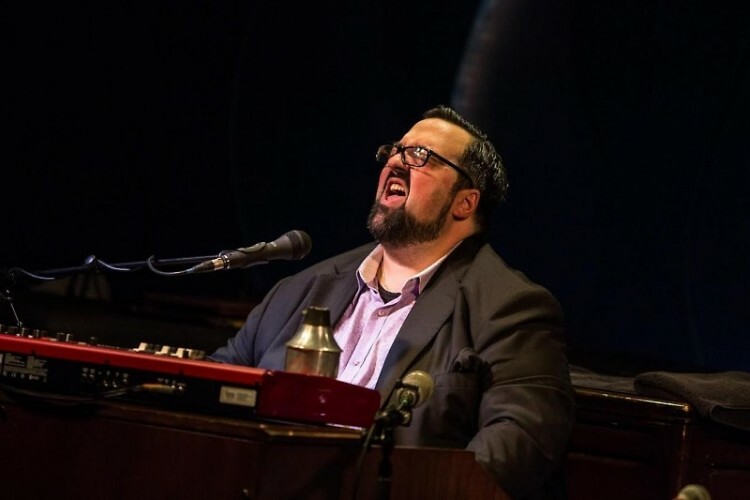 Applauded as “one of the best Hammond B-3 organ players on the planet” (by Jazz Times), Joey DeFrancesco released a new album with “The People” in summer 2017 with Mack Avenue Records entitled “Project Freedom.” The album features DeFrancesco on the Hammond B-3 organ, along with contributions on keyboards, trumpet and as a vocalist. “Project Freedom” mixes “barnburners with stirring, soulful material” according to Phillip Booth, writer for JazzTimes. “Project Freedom” includes inspiring originals by DeFrancesco and music covers from Sam Cooke – A Change is Gonna Comeand John Lennon – Imagine. In 2018, DeFrancesco teamed up with Van Morrison on Morrison’s 2018 album entitled “You’re Driving Me Crazy.” The album included Van Morrison, Joey DeFrancesco, Dan Wilson and Troy Roberts (from “The People”) and drummer Michael Ode in a hard-driving soul-jazz sound. The final Jazz Series Concert during SCMC 135thanniversary season will be on March 7 and will feature rising jazz star singer Veronica Swift and the Benny Green Trio. Veronica Swift has launched her debut album “It’s Great to Be Alive” which features the great pianist Benny Green and his trio. At age 24, Veronica Swift is now being recognized around the country as one of the top young jazz singers on the scene. Benny Green, a veteran of the jazz world combines a mastery of keyboard technique with decades of real world experience playing with no one less than the most celebrated artists of the last half century. Joey DeFrancesco was raised in Philadelphia where his musical roots in jazz, blues and other musical art forms were born. To hear Joey DeFrancesco today, his music embodies the traditional art form infused with a distinct modern approach, just part of what makes his music unmistakably his own. DeFrancesco has recorded and/or toured with his own groups as well as numerous renowned artists that include Ray Charles, Diana Krall, Nancy Wilson, George Benson, James Moody, John Scofield, Bobby Hutcherson, Jimmy Cobb, John McLaughlin, Larry Coryell, David Sanborn and many more. The four time Grammy® Award-nominee, with more than 30 recordings as a leader under his belt, has received countless Jazz Journalist Association awards and other accolades worldwide, including being inducted into the inaugural Hammond Organ Hall of Fame in 2014, the Philadelphia Music Walk of Fame in 2016 as well as topping the Critics Polls in DownBeat Magazine eleven times over the past fifteen years and the Readers Polls every year since 2005. DeFrancesco also hosts a weekly program on SiriusXM Radio's Real Jazz channel titled "Organized." 2018 saw DeFrancesco touring in support of his Grammy nominated record, Project Freedom, as well as select concert dates celebrating the collaborative recording with iconic recording artist Van Morrison, titled You're Driving Me Crazy. Béla Fleck & Abigail Washburn on February 9, 2019. “The king and queen of the banjo”first appeared together on stage at SCMC in February 2018. The audience adored meeting and hearing them perform together. With a strong fan base in Grand Rapids, SCMC is delighted to bring the two of them back for an encore performance. The War and Treaty will appear in concert on Sunday, February 24, 2019. Chilling, soulful, and powerful are just some of the words used by audiences to describe The War and Treaty. The husband & wife duo blend roots, folk, gospel, and soul, reaching back through their deep-rooted history to conjure up the strength of their ancestors. They are currently on tour, hoping to share songs of reconciliation and humanity, and taking listeners on a soaring, emotional ride. They recently were the warm up band for the sold-out Bob Seger concert in Grand Rapids in November 2018. The Milk Carton Kids, two-time Grammy nominees and winners of The Best Duo Group of the Year by American Music Group Association, will appear onFebruary 28, 2019. The Milk Carton Kids are a a popular American indie folk duo – Joey Ryan and Kenneth Pattengale – from Eagle Rock, California.They are touring to support their new album All the Things I Did and All the Things I Didn’t Doand it’s their first time touring with a full band.